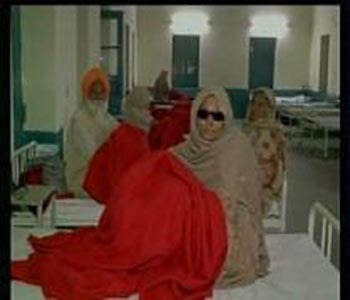 Gurdaspur (Punjab), Dec 5 - At least 14 senior citizens lost their eyesight after they allegedly underwent eye surgeries at a free medical camp organized by an NGO in Punjab's Gurdaspur district on Friday. "A bus full people reached the camp. After operation, some kind of infection started to develop in the brain area as well. When we consulted other doctors, they told us that the eye pupils are missing," said one of the victims. "All those guilty must be punished and the sufferers should be provided with the compensation. All the people who came here were majorly of old age. The doctors who are setting up such camps should be barred from doing so," added the victim's daughter. All the patients belonged to Amritsar district. Meanwhile, condemning the incident, Congress leader Rashid Alvi said, "It's unfortunate, strict investigation should be done against the NGO. In both the states of Chhattisgarh and Punjab it is BJP and allies where such incidents have happened. This shows that the BJP is not working properly." In a similar such incident last month, 13 women were killed and more than 50 were in a critical state in the botched sterilization drive in Bilaspur, Chhattisgarh.